My initial commit contained some log files. I've added *log to my .gitignore, and now I want to remove the log files from my repository. will remove a file from the repository, but will also remove it from the local file system. How can I remove this file from the repo without deleting my local copy of the file? When --cached is given, the staged content has to match either the tip of the branch or the file on disk, allowing the file to be removed from just the index. I had committed some resharper files, and did not want those to persist for other project users. 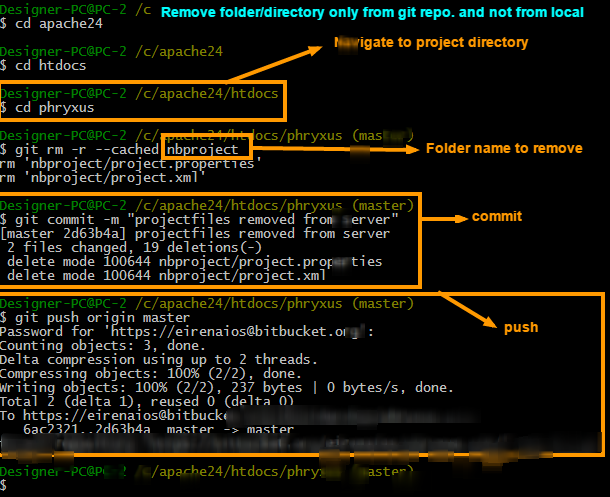 To remove folder/directory or file only from git repository and not from the local try 3 simple steps. git commit -m "Removed folder from repository"
Remove all items from index. Git lets you ignore those files by assuming they are unchanged. This is done by running the git update-index --assume-unchanged path/to/file.txt command. Once marking a file as such, git will completely ignore any changes on that file; they will not show up when running git status or git diff, nor will they ever be committed. Note: This isn't answering the question directly, but is based on follow up questions in the comments of the other answers. Above answers didn't work for me. I used filter-branch to remove all committed files. This removes the directory or file from all the commits. Not the answer you're looking for? Browse other questions tagged git repository remote-server delete-file git-rm or ask your own question. How to delete a file in remote repository ONLY? When does `git rm` remove a file only from the index, and when from the index and working directory simultaneously? Remove folder in git repo? How to remove a directory from git repository? How to ignore certain files in git?